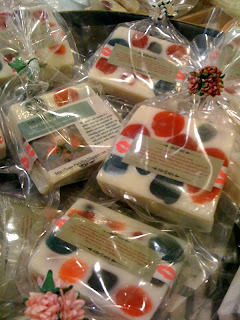 I adore these nougat, my answer to keeping your family germ free the natural way. It has eucalyptus and tea-tree essential oils which does keep germs abay. The goat's milk makes it a gentle soap but with a punch. The blend of essential oils together with the honey are safe for cleaning grimey little hands and if you are worried about the smell of essential oil combination for young ones, the eyes do play a little trick on the nose. When my son sees and smell it he thinks it smells like cherries and I have absolutely no problem getting him to use it. It's a great soap for the whole family.